With today’s economy, it is practical to consider all of your options when shopping for theater seating. Used theater seating, will be, no doubt less money than brand new theater seating. Many times used theater seating is half the price of new theater seating. So why not choose used theater seats? Well, ‘used’ means that the movie chairs can show some signs of wear, used theater seats usually come with only a 30-day warranty, and they come in the color that they are in, in other words you do not get to choose your fabric color, it is already decided for you. So let’s talk about these concerns. “Signs of wear”: when purchasing used theater seats always ask the seller, what is the condition of the theater seating? If there are scratches, where are they? How bad are they? Scuff marks on plastic theater seating rear-of-back shells can easily have their appearance lessened by applying a plastic / vinyl protestant such as Armor All®. Scratches on metal legs or seat pans can be touched up with paint, or repainted entirely. “Soiled fabric”: Fabric can be cleaned; in fact, some used theater seat cushion bottom covers can actually be easily removed and simply placed in a machine clothes washer for cleaning. You definitely do not want a used theater seat that has any rips or tears in the fabric. ‘Fabric color choice’: The color that the seller got the chairs in is usually the only color you can get. So it may be prudent to order some ‘attic stock’ theater seating, to keep as spares. Remember theater seats last a long time, 15 years at least. So who knows if you might have to replace a cushion 10 years from now? Matching fabric again in the future can be near impossible. So those are some of the things that are good to consider when deciding if you should go with new or used theater seats. New seats come with a 5-year warranty, you can choose your fabric color from 50+ colors, and you can choose the height, width, and armrest preferences. Posted in See all theater seating blog posts | Comments Off on Used or New Theater seats for your home theater or auditorium? Brand new, real theater seating. These chairs have been designed with movie viewing in mind. 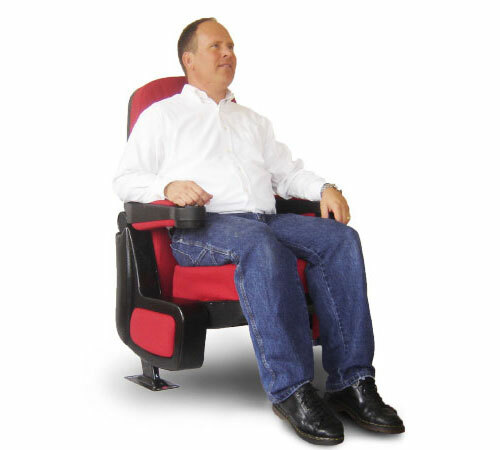 Perfect for Cinemas, Theaters, Performing Arts Centers, Screening Rooms, Media Centers, and as Home Theater Seating. The generous widths (22-inch, 23-inch, or 24-inch), provides spacious comfort. The back heights (40.5-inch or 42-inch) provides support for shoulders and neck. Scratch and dent resistant poly rear-of-back panel and seat bucket. Commercial grade upholstered on the chairs back and seat cushion. (We strive to keep Black and Scarlet Red (a darker red) upholstery fabric in stock at all times). The cup holder located in the armrest provides a convenient place to keep your drinks close at hand. Decorative aisle / end panels are available. The elegance and graceful design of the Cinema Star Rocker makes this classic line a very popular choice for theatergoers. This model of chairs evokes a relaxed and easy-going quality with its flawless lines and pleasing curves. The Cinema Star Rocker is one of our all-time best sellers. Sit back with a cold soda, some hot popcorn and enjoy your favorite movie in this ergonomically engineered for comfort, cinema chair. Factory direct theater seating that’s open to the public. Plus we specialize in small orders, and all of our home theater seating comes with a 5-year warranty! That´s right. Get new, freshly made from the factory, real Celebrity Seating theater seats and chairs for your theater project! Turnaround time is JUST 10 business days! You gotta love it! Need a few theater chairs for home theater seating? Need 50 theater seats for your presentation room or media center? Need a quantity of 500 theater seating for your auditorium? Not a problem, free quotes on any size order. Wholesale theater seating prices, factory direct to you. These real movie theater seats are chairs DESIGNED for movie viewing. From the one of the WORLD´S LEADING THEATER SEATING MANUFACTURER, Celebrity Seating! Posted in See all theater seating blog posts | Comments Off on Factory direct theater seating that’s open to the public.